Raise your game - become a Certified Management Accountant (CMA) in 2018! Our website welcomes you as we move into 2018! We hope you can join us Tuesday, January 9, 2018, 7:00 AM for our next Government Contractors' Breakfast, focusing on issues related to the DCAA. This meeting is located at the Tower Club , 8000 Towers Crescent Drive, Suite 1700, Tysons, VA 22182. One hour of CPE, along with a breakfast buffet await you! Doors open at 7:00 AM, Speaker starts at 8:00 AM, and you'll be done by 9:30 AM. As you prepare your 2018 calendar, please plan on joining our chapter on February 7, 2018 , for a late afternoon CPE session in Upper Marlboro, MD, with dinner by Ledo Pizza! Our topic focuses on the Costs, Benefits, and Risks related to Environmental Management . Our speaker, Professor Debra Mc Laughlin, looks forward to welcoming you to UMUC and a lively discussion! Our initial CPE session begins at 4 p.m. with a discussion of investments in facilities management including utilities. The costs related to new processes are often offset by decreased operating costs. How do we measure cost savings, especially prior to the initial installation? Please plan on joining us for a comprehensive vision into the environment from an accounting and finance view! Traffic with this early start, and 7 p.m. adjournment should be a delightful change from the normal routine! Watch for details on cost and the registration link on our website . Please encourage students and professionals to consider the value of our Certified Management Accountant Program! The CMA certification is truly a door opener! Nominations for the 2018/2019 chapter board will begin soon. Please contact me at president@nationscapital.org to volunteer, to serve as a member of the nominating committee, or as a nominee! Best wishes as the holidays continue and we open 2018! Table topic attendees discussed perspective related to using technology efficiently, as well as how technology might increase efficiency. Our featured speaker, Justin Herring, presented an illustrated view into the costs and benefits of Technology Business Management (TBM) for our November 8 dinner and technical CPE meeting. Our twelve attendees discovered many connections and applications to the documentation and management possibilities of a systematic approach to TBM. Leon Hutton is the Deputy Chief of the Financial Management Division, Office of the Chief Financial Officer, US Citizenship and Immigration Services, Department of Homeland Security, a position he has held for five years. 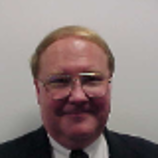 He is a Virginia-licensed CPA, earned the Certified Government Financial Management designation, and is completing a doctorate degree (DBA) studying the mitigating effects of internal controls on veteran-owned small businesses in the Northern Virginia area. He served 20 years in the US Army and the past 21 years in the Federal civil service – all positions in accounting and finance. 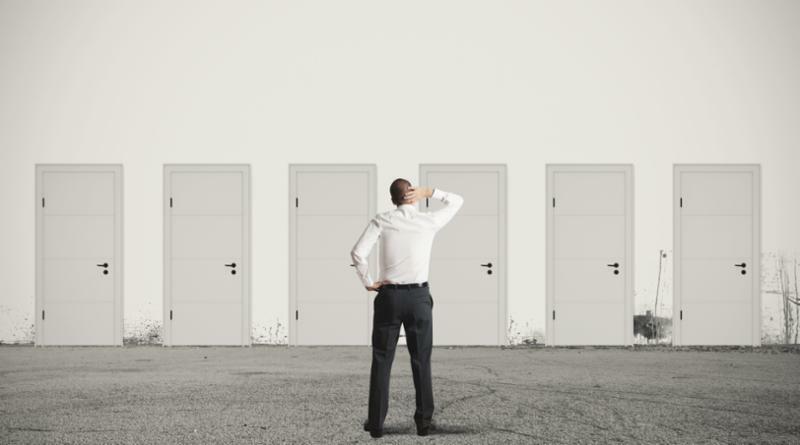 How did you decide on a career path in Accounting? Growing up, my father worked as a life insurance agent for Prudential, and he often took my sister and me into his office and also on his rounds as he collected the monthly premium payments from clients. During these experiences, I could see his passion for his work and his belief in that what he was doing was providing consistent, reliable, quality service to his customers, a value that is held close to the accounting profession. I began college as a business major, but switched to accounting after reviewing a friend’s accounting textbook. At that time in my life I was more of an introvert and suspected I may not be successful in sales. Have you had different roles and responsibilities within the Accounting career field? Would you please elaborate? I have been very fortunate to have worked for several of the absolutely best bosses possible - true mentors of impeccable integrity, knowledge and inspirational leadership. I did have many ‘traditional’ accounting jobs both in the Army and Federal civil service, but two special ones come to mind. Serving in the Army near the end of my military career, I was the principal financial advisor to the US Delegation negotiating costs issues with representatives of the former Soviet Union concerning the INF Treaty – there are two INF missiles in the Smithsonian’s Air and Space Museum as a direct result of our work. And later, working as a civilian for the US Coast Guard, which is indisputably an incredible organization comprised of dedicated professionals all committed to their one overarching principle: always ready. What is your favorite aspect of the Finance/Management Accounting Profession? My favorite aspect of the finance and accounting profession is working with the staff, managers and leadership within the Office of the Chief Financial Officer (OCFO) each and every day where we collaborate to solve problems, implement new policy as it presents itself (and sometimes get to develop it ourselves), and continuously work to improve services and products for our Agency’s leadership and our customers. When and how did you first become involved with the IMA? About three years ago I attended a local chapter IMA meeting, enjoyed the people and program, and joined that night. What has been the most fulfilling aspect of volunteering with the IMA? Getting to meet new people with similar professional backgrounds yet varied specializations and personal interests. What do you believe is the best way an individual can find their ideal career path? Purchase the book, What Color Is Your Parachute . This is not a book one reads for pleasure – it is a work book, and one that will help you identify strengths and areas for improvement; it is full of very helpful advice on job-hunting and career changes, but also helps you figure out who you are as a person. It is updated annually, and I always have the latest version available for review. Do you have any advice to new members or people starting their career in Accounting? Plan on being a life-long learner. Learn the accounting business; learn as much as you can about our profession. Seek to be a little bit better each day. Learn about and understand the organization and industry where you work; then switch industries and learn something new. Volunteer for special assignments or projects. Never stop learning and growing; study and learn things beyond accounting, finance and business. Travel; meet new people in different cultures. Don’t stay in a comfort zone for too long as it stifles growth. Under-promise and over-deliver – continuously. Read famous authors’ works; read books for pleasure, just read. Accounting today is about providing consistent, quality service with absolute integrity. My mentor, Professor Joe Hoyle, is noted for saying our integrity is really all we have – once lost, it is almost impossible to regain. Accounting and finance academics, and practitioners, submit your ethics case for this competition by January 26, 2018 . The winning case will be featured in Strategic Finance magazine, and the case author or team will be recognized at IMA’s Annual Conference & Exposition in June 2018. The winner also will receive one complimentary conference registration and a $500 cash prize. The 2017-18 IMA Global Board of Directors held its initial meeting in late October. 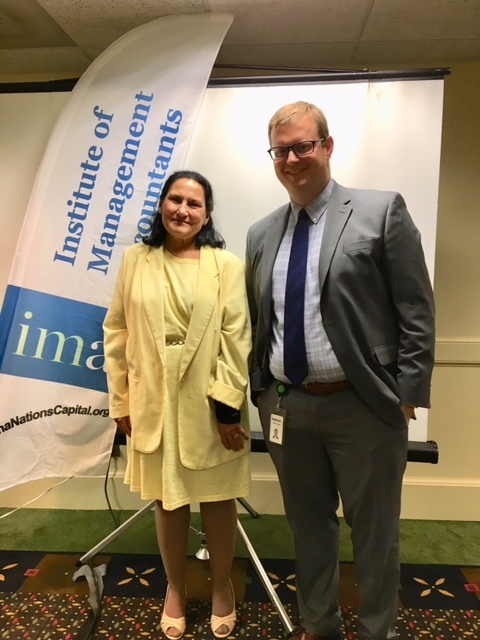 The meeting took place in northern New Jersey, providing a unique opportunity for the Board to visit IMA’s headquarters in Montvale. Our HQ staff went above and beyond the call of duty to host us after-hours, providing tours of the facility and responding to our questions about what they do and how they carry out IMA’s mission. It was a great pleasure to finally meet in person many of the people I’ve spoken with over the years, and who work on behalf of all IMA members every day. Their enthusiasm, dedication, and skill have made IMA what it is today. The second ad in the CMA integrated marketing campaign was unveiled. It features a "future of accounting" theme, focusing on one of the hottest topics affecting many professions today—artificial intelligence. How will AI affect management accounting jobs in the future? Click here to see the ad, which is currently running in major media markets. Spurred by world-wide demand for our certifications, and particularly the success of the CMA program in the Middle East and China, IMA membership surged past the 94,000 mark last month—just a few hundred members short of the all-time high, and well on the way to reaching our goal of 100,000 members by our 100th anniversary in a year and a half. The CSCA® (Certified in Strategy and Competitive Analysis) credential is off to a strong start. This newly-launched certification complements and expands upon the strategic planning, competitive analysis, and decision-making skills developed through the CMA program. The next testing window will take place in March. Plans for ACE2018, IMA’s 99th Annual Conference and Expo, are being finalized. Detailed information, including speakers, will be available shortly on the IMA website . Mark your calendars now and plan to join us June 16-20 in Indianapolis. In the meantime, best wishes for the holidays and for a happy and healthy New Year! SCMS Members and Governors the Board of Governors' Winter Meeting will be on February 18, 2018 , in sunny San Diego, CA. IMA students, young professionals, and educators, create your own CMA video and you can win up to $2,500. The submission deadline is January 31, 2018! Click here for more information. CMAs save $250 when you register for the March CSCA exam testing window by January 31, 2018 . Click here to learn more.